I'm so excited to offer this giveaway to my readers and have many bloggers to thank for their participation! I highly suggest that you visit before or after you are done entering the RC below. They have plenty of valuable information and giveaways to boot! Did you just move into a new home and can't think of how to decorate your rooms? Perhaps you're missing that extra piece of style to make a room complete? A rug can do wonders for the ambiance and feel of a room. 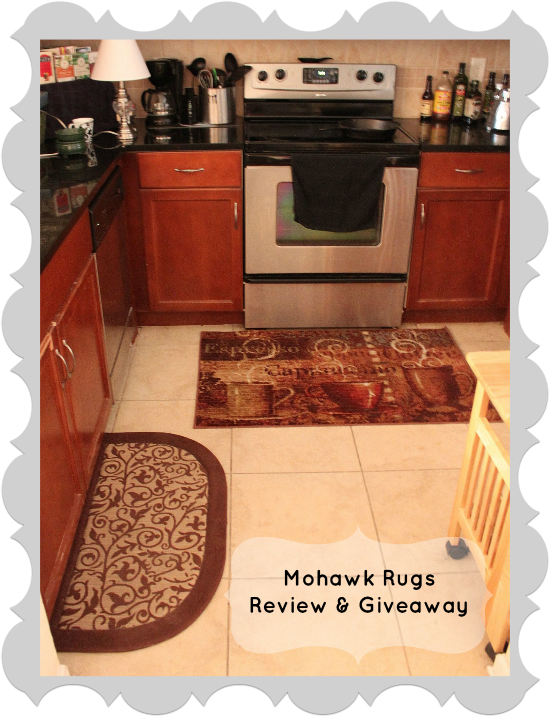 When I had the opportunity to review for Mohawk rugs, I was very excited. Several of my rooms were begging for rugs. Especially the kitchen. Once I plopped these puppies down, they transformed my kitchen! I ordered two rugs under $60 and they're both gorgeous. Brown Leaves Memory Foam Rug - Beautiful design, Comfortable, with thick memory foam padding. Much better than standing on my hard tile floor when doing dishes. Baroque Kitchen Coffee Rug - A Nice array of neutral and dark colors, clear design, thick and soft to the touch. I wanted a kitchen rug that would take up a good amount of the tile that coordinated well with my kitchen decor, but also would be able to camouflage stains and crumbs. Choosing a darker brown seemed perfect to me and I was right. Especially for right under the stove and where I prepare food. The smaller rug is for the sink area where crumbs and dirt fall less. Being a bit of a coffee connoisseur, I love how the rugs look with the coffee cups showing the words Cappuccino, Espresso and Coffee. It's inviting to wake up to in the morning. They also have a whimsical touch with the way the steam comes out of the cups in scrolls and the other rug is full of scrolling that I love. It's hard to find unique rugs that don't look like a child drew a picture on them. The designs on these are very pretty. Both rugs are spot clean only so I do have to be careful, but overall, I think these rugs are definitely worth the money. They have held up exceptionally well in the month I have used them. I just take them outside to flap the crumbs etc off and good as new. I haven't needed to use a damp cloth on it as of yet. It's hard to find exactly what I want in my price range and these were on the ball. They are made extremely durable with little slipping compared to others I have had and I know they will last a long time as long as I treat them like they're works of art, which they are. Now I just need to find some cute matching coffee cup towels! In addition to their site, Mohawk rugs can be found at Kohls, Target and other fine retailers. Check out all the many rugs they have to offer, including area, kitchen, outdoor and more. I encourage you to keep up with promotions through their Facebook and Twitter as well! Mohawk rugs are fine quality and always made in the U.S.A.
What a great prize for this giveaway!! I love the designs of the rugs!! They are so cool and fashionable :) Good luck to everyone that enters this great giveaway!